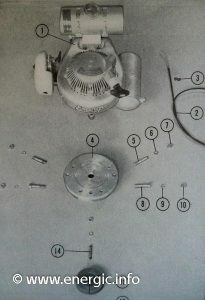 Energic Motobineuse Type L 77 brochure. This versatile machine can be transformed into a motoculteur, motobecheuse, microtracteur and a mototondeuse from the original Motobineuse. 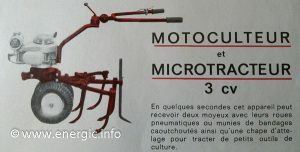 Energic Motobineuse Type L 77 Motoculteur, Microtracteur. Energic type 77 transformed into a Motoculteur with hoe. Energic type 77 transformed into a Microtracteur pulling a remorque in style. 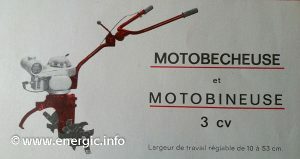 The motobineuse can be transformed into a 3cv motoculteur and microtracteur in seconds. 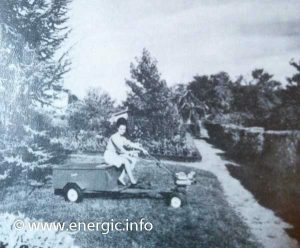 Pulling up to 150kgs, the energic trailer exists (see photo) dimensions 1.20m long x 0.80m wide x 0.40 heigh with brakes operated from the handle bars. By attaching the set of wheels and hitch to pull implements such as a small plough, hoe etc. Energic transformed into a Motobineuse or Motobêche Type L 77. 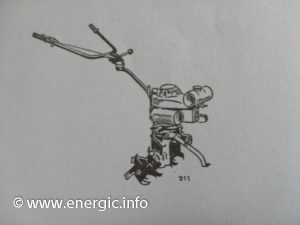 Energic Motobineuse/Motobêche Type L 77. Very useful in small holdings and garden vegetable patches. Up to 53 cms wide of you replace the axle of 22cms standard with a larger 46/53 cms axle. Energic Motobineuse transformed into a mototoneuse Type L 77. 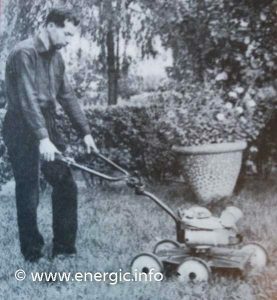 Energic Motobineuse Type L 77 transformed into a mototondeuse for use on small/medium gardens. 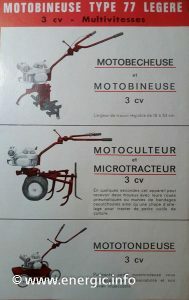 The mototondeuse for use on small/medium gardens, and can be changed back quickly into the motobineuse form. The cut is 46 cms, with 4 cut heights of between 2 and 8 cms. For and extra cost you can have a rear grass collector bag/box. Engine. ILO Horizontal single cylinder 73cm3, 3cv, 2 stroke, alésage 43 m/m x course 50 m/m. See pages about Energic ILO moteurs here. Air filter. 2 types depending upon the price of the machine; Dry humidity cartridge or filter in a bath of oil at – additional price. Starting. By pulling cord, there was a option at extra cost of a automatic start system. Transmission. Encased in oil, screw type on a “Timken” system of bearings. Gear/s. 1 normally, but using an option mechanic you could obtain up to 8 speeds. 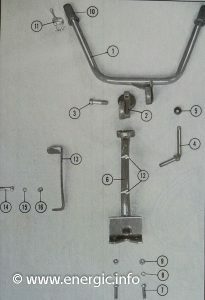 Energic Motobineuse/Motobêche Type L 77 moteur ILO 77cc handlebars. Consummation. 0.8 to 1.2 liters per hour dependent upon working conditions. 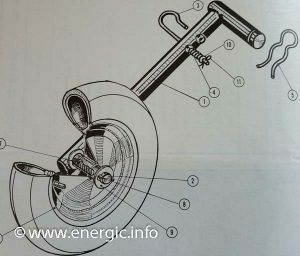 Energic Motobineuse/Motobêche Type L 77 moteur ILO 77cc front supporting wheel. Adaptions. For hoeing/binage 7 setting between 10 to 53cm, for /buttage 5 settings between 15 to 46cms. 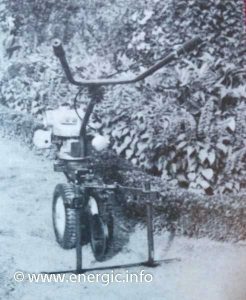 Grass cutter, plow/buttoir, hitch remorque, wheeled micro tracteur for pulling etc. Read more about the Motobineuse type MVR 75 here.